Life goes on. Despite all the conflict, loss, and uncertainty for the future, displaced families in Iraq show tremendous resilience as they work to rebuild shattered lives. For mothers, that may mean giving birth while living in a crowded camp or in the shell of an unfinished building. 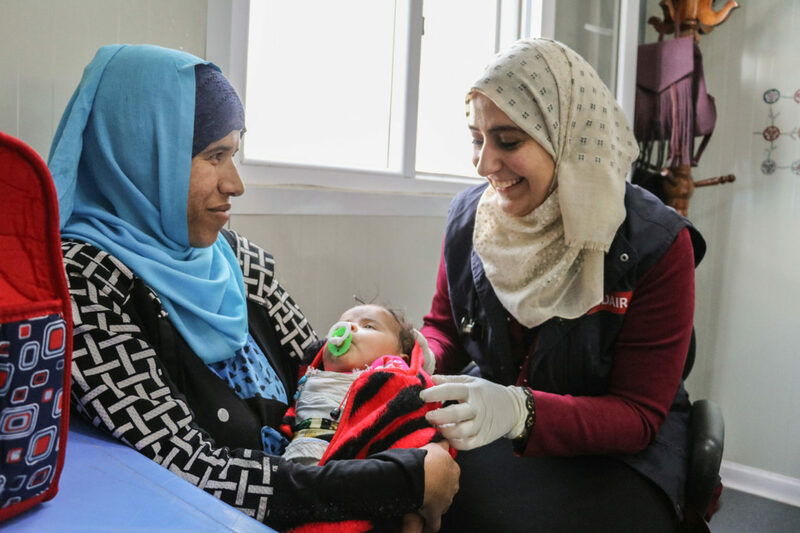 Fazia visits the Medair clinic with her son Hassan. Fazia lives in Laylan 2 camp with her family of six in a two-room tent and she shares a kitchen and washroom with four other families. 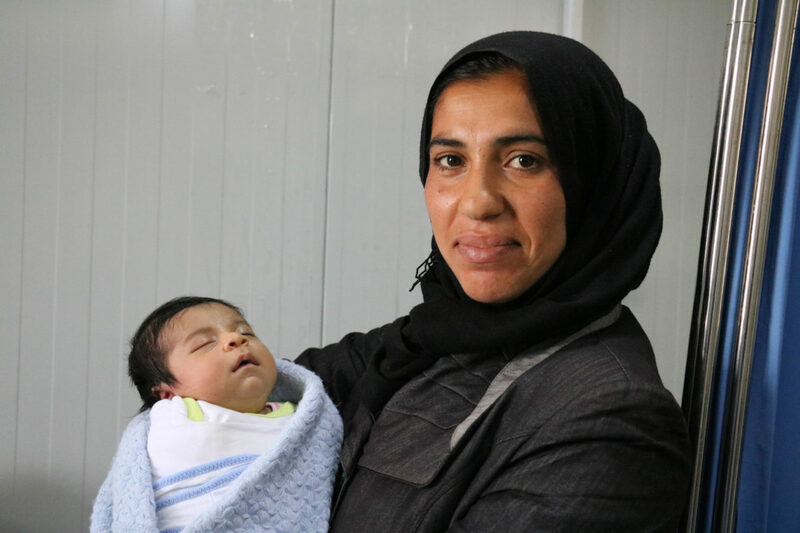 Her son Hassan is 26 days old, and he has developed jaundice. Fazia and Hassan depend on Medair’s free primary care clinic in Laylan 2 Camp. They have visited the doctor five times since Hassan’s birth to monitor his condition. While at the clinic, Fazia also receives postnatal examinations. Our health team noticed that few mothers were coming in for their postnatal examinations. 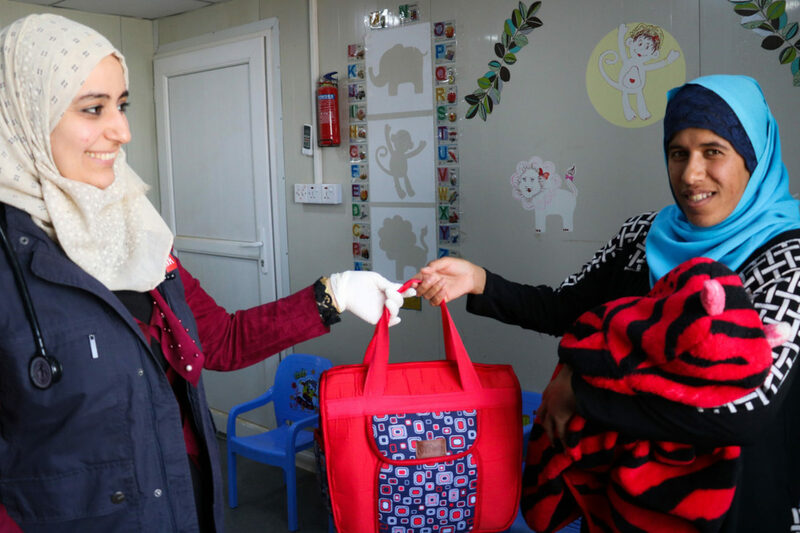 They came up with the idea of assembling a free kit of baby supplies that they would give as a gift for mothers who came in for a postnatal exam. Hannah and Alea receive a postnatal exam at the Medair clinic. When Fazia visited the clinic with Hassan, she brought her friend Hannah. Fazia was thrilled to learn that Hassan’s condition had improved and his weight was healthy. Meanwhile, Hannah and her newborn girl Alea were examined by the doctors. During a postnatal examination, doctors and nurses examine the mother and child for infection, discuss how the baby is feeding, and check the hearing, vital signs, reflexes, and weight gain of the infant. Your gifts help bring new life into the world. Join the journey with Medair today. In Iraq, Medair provides vulnerable people with shelter, health care, psychosocial support, safe drinking water, latrines, and hygiene. Medair’s work in Iraq is supported by the US Agency for International Development (USAID), EU Civil Protection and Humanitarian Aid, and generous private donors.